This shot has been a favorite of mine on many fronts. The memory surrounding it, primarily. The composition. The colors. Usual suspects that make up an image. But for me, specially so. We came to this point on our #PoshGoondas ride after a fairly wet, drenching ride from Nako, via Tabo Monastery. As we ate up the kilometers, the skies cleared up to show off the uniquely blue tint, white clouds and some decent but dirt/gravel roads. The arid, yet mesmerizing landscape we passed through practically tore us between enjoying the ride or stopping every minute to capture Nature as we had never seen before. This particular spot was where the Spiti River was at its widest. As we turned a corner, the world opened up. Spiti River in a wide delta area with sand banks and rocks interspersed, dotting the waters and creating mini wakes, as the water flowed around, past and over them. The road along one shore, and mountain along the other, lined with lush green Trees along bottom. Suffice to say, we spent quite some time enjoying the vista, trying to capture as much as we could into our mind’s camera. It was easy to cross the river on foot at most sections along sand banks and rocks. The elevation still left us breathless on any sort of exertion and we tread slowly but surely towards the middle. Beyond this point the river flow was stronger and deeper. This spot was about the furthest I could go – trying to get close to the middle for a good composition. Taking a picture low over the water and looking out through the valley; I had to get a shot. I had to bend low and compose the shot through the the tilted LCD screen. This pressed on the lungs and added to the breathlessness caused by the elevation. Few quick shots and I was done! That or being prone in water gasping for air. In my mind this shot really does justice to the expansive mountains, valleys and the enormous skies! Add to that, the smooth – almost machined smooth – rocks on the river bed. 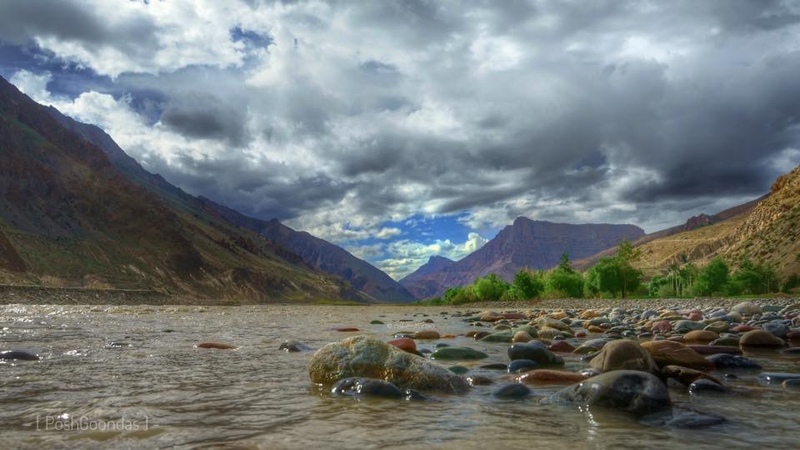 The brown dull waters, the shinning smooth colorful rocks, the lush trees leading the eye through the valley with its brown arid mountains and up to the blue skies protected by the white-gray blanket of clouds. The spot; vivid and memorable. This image; a favorite for years to come. “There will always be rocks in the road ahead of us.